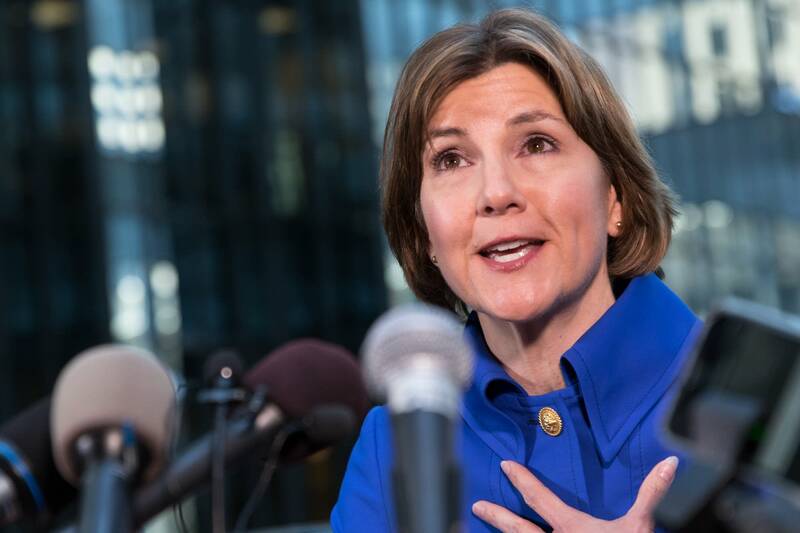 At a downtown Minneapolis restaurant overlooking the IDS lobby, Lori Swanson sat crouched on a black, tufted couch with a coffee mug, a glass of water and a bunch of microphones in front of her. 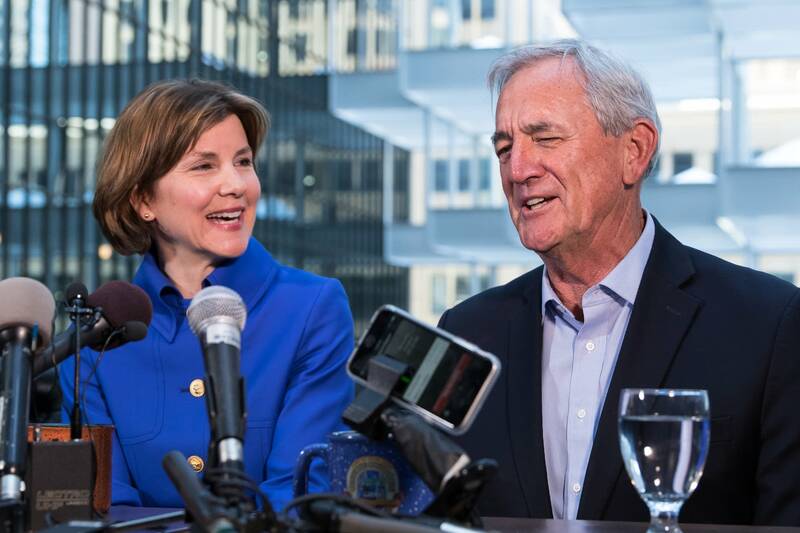 There were no signs or supporters, just Rick Nolan, a retiring congressman, sitting at her side as they announced their plan to jump into a suddenly crowded, three-way DFL primary race for governor and lieutenant governor. Their announcement came not a moment too soon: the June 5 deadline to file and run for office was just 24 hours away. "We're a couple of problem solvers," Swanson told reporters, who rushed to get to the impromptu press conference. Though the event didn't have the pomp that typically goes with launching a campaign for governor, the whole thing was vintage Swanson. 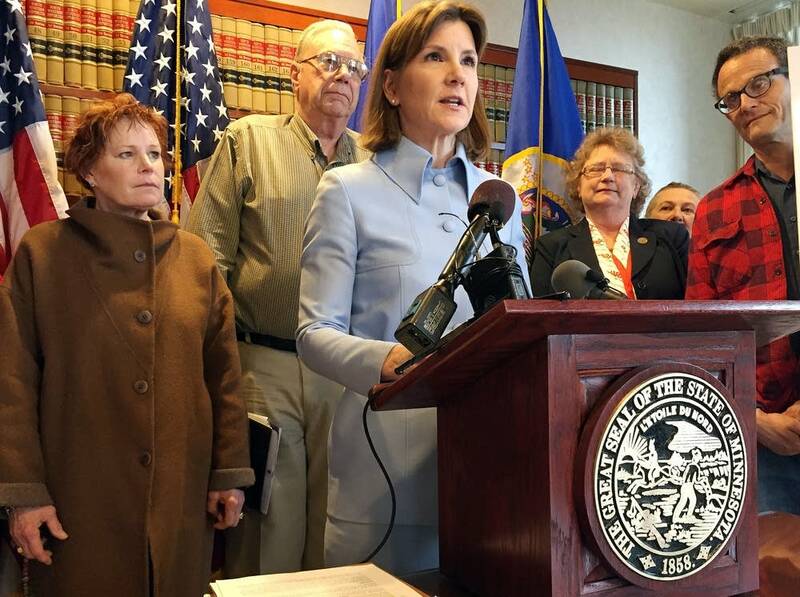 It was a similar last-minute entrance into a three-way DFL primary for attorney general that launched Swanson's political career more than a decade ago. Since then, she has quietly built a statewide profile as Minnesota's chief consumer protection advocate, taking on big companies in court for allegedly ripping off the little guys. It's this carefully constructed public profile that's already become an asset to her in a DFL primary for governor, with the two other top candidates, U.S. Rep. Tim Walz and state Rep. Erin Murphy, just now introducing themselves to a statewide audience. Swanson's and Walz's internal polling show Swanson is leading in the race. But little else is known of Swanson, an atypically private politician who runs a tightly-controlled office and makes few public appearances. When sexual harassment allegations emerged this month against a former staffer in the office of her running mate, Rick Nolan, the hashtag #WhereIsLori cropped up on social media after more than 24 hours without a response. As she steps out into the race for governor, an open seat with high stakes for both sides, it's already put more scrutiny on her positions and record as attorney general. 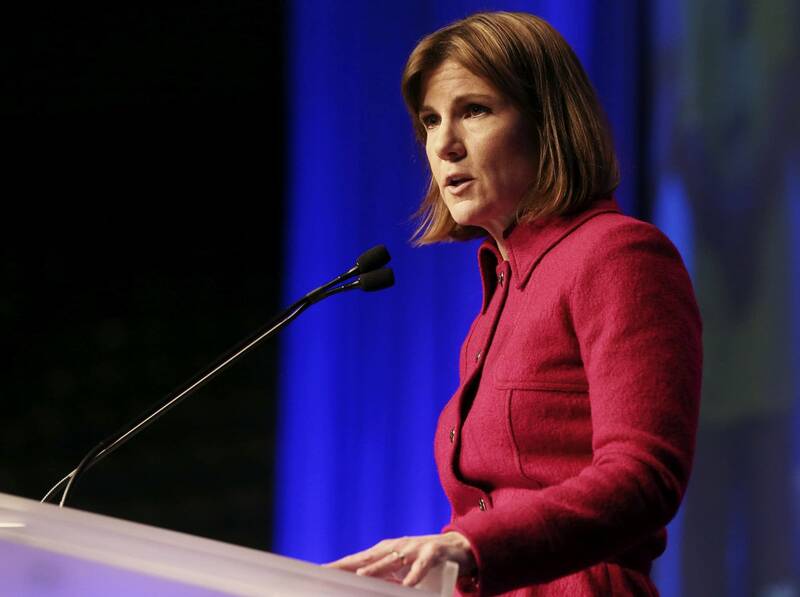 The race will also introduce her to a larger audience that simply wants to know: Who is Lori Swanson? Swanson lives in Eagan with her husband, Gary, and her golden retriever Taffy, who has been a frequent companion on Swanson's campaign materials. She describes herself as a "disciplined cross trainer" and her hobbies include trapshooting and reading books about U.S. presidential history. Raised near Milwaukee, the daughter of a mechanical engineer and a homemaker, Swanson, 51, said she was a "voracious" reader and writer who was fascinated by the Watergate scandal. "I remember being a kid asking a lot of questions about Watergate, and sometimes people would say, that's not for young kids to know anything about," Swanson said. Hoping to become an investigative journalist, Swanson headed to the University of Wisconsin to study political science and journalism. One of her first jobs out of college, though, took her to the Minnesota Commerce Department under then-commissioner Mike Hatch. In her new job, Swanson was an analyst assigned a workers' compensation report. Hatch recalled being so impressed by the report he asked to meet the author, immediately saw her potential and encouraged her to go to law school. He would become one of the most important mentors in her career. "This is the most difficult thing for politicians, but she can see the world at 30,000 feet," Hatch said. "Most of us can't do that, we get caught in the weeds." Swanson went to what is now the Mitchell Hamline School of Law in St. Paul and joined Hatch's private practice after graduating, where she cut her teeth on dozens of cases representing women with breast cancer who were denied health coverage. It was a formative experience for Swanson in shaping the kind of work she wanted to focus on in her law career. "[They were] very emotional cases, life or death cases," Swanson said. "You really saw there it can be pretty hard if you don't have armies of lawyers or lobbyists representing you to get the government to work for you and to represent you." Politics came later. In 1998, Hatch ran to be Minnesota's attorney general, and Swanson helped run his campaign. When he won, she joined him as an attorney in the office, moving up from solicitor general to deputy attorney general at 32, the youngest person ever appointed to that role. By 2006, Hatch had set his sights on the governor's office and was the DFL-endorsed candidate in that race. The race to replace him as attorney general fell into disarray after it was discovered the leading DFL candidate, House Minority Leader Matt Entenza, had been trying to dig up dirt on Hatch. Entenza dropped out at last minute, and Swanson jumped in. Swanson wasn't well known; the majority of her career had been behind the scenes in the attorney general's office. But she set herself apart from her opponents, two male lawmakers with much more established public profiles and long voting records. She highlighted her experience in the office working on consumer protection cases. She prevailed in the primary and won in November, too, beating Republican challenger Jeff Johnson, who is now running for governor. Her victory was historic: Swanson became the first woman to serve as Minnesota's attorney general. In her first week in office, Swanson immediately set the tone for her administration, suing insurance giant Allianz Life. She said the company, which has its North American headquarters in Minneapolis, sold citizens long-term annuities that stretched well beyond their life expectancies, landing $450 million in settlements for thousands of senior citizens. Her work followed a similar pattern throughout her administration. Swanson sued Sprint Nextel Corp., alleging that the company improperly extended cell phone contracts. She charged CenturyLink with systematically overbilling its customers for internet service. She led a national investigation that found National Arbitration Forum operated a rigged scheme that guaranteed more cases would end up in arbitration than in court. Early in her administration, Swanson also worked with state lawmakers to pass a bill targeting predatory lenders, requiring them to verify a borrower's ability to repay a loan. "She was on predatory lending before the rest of the country knew about it. She knew that it was important," said Leslie Sandberg, who worked as a press secretary in the attorney general's office. "She is able to really understand what's happening to consumers and she acts quickly." But Swanson's time as attorney general has not been without controversy. Within a year of taking office, her administration resisted efforts to unionize attorneys, who were at-will employees. During the same period, 50 assistant attorneys general of roughly 150 had left or been fired from the office. The culture inside the office was briefly under the scrutiny of the Office of the Legislative Auditor in 2008, which found some attorneys feared retaliation if they pushed back on Swanson or Hatch, who lost the governor's race and remained on in the office even after Swanson initially took over. Employees interviewed also said they felt pressure to focus on "obtaining favorable media attention rather than the methodical legal work required to successfully litigate cases," according to the report. "There's a very short-term focus on reputation as paramount above all other issues. How things will appear in the press often became almost the sole criteria for judging success or failure," said Prentiss Cox, a law professor at the University of Minnesota who worked with Swanson in the office for years. Cox and others have also criticized Swanson for essentially eliminating the historic role of the attorney general's role in defending state agencies and helping county prosecutors with high profile cases. With its almost exclusive focus on consumer protection cases, a once nationally regarded office has turned into a dud, the critics say. "There is an intense focus on their career advancement above all other goals," Cox said. "That leaves people who want to do good work out in the cold and not interested in working for the attorney general." Swanson defends her record on consumer protection cases, noting her office handles an average of 5,000 filings a year. "I would challenge anybody who doesn't like those cases, tell me which case you don't like, because they are all very important," Swanson said. "The average person doesn't have a lawyer or a lobbyist representing them, but I think it's important that they have an attorney general who is in their corner." Swanson has been in the mix as a potential governor candidate for years, and she was considering jumping into the race as early as last year. But in January, she announced she planned to run for a fourth term as attorney general, in part, she said, because she was in the midst of a huge lawsuit against Minnesota-based 3M, alleging they introduced pollutants into the water in surrounding communities. That case ultimately settled for $850 million a few months before Swanson headed into the DFL Party's convention in Rochester. But an upset was brewing: little-known activist Matt Pelikan challenged Swanson from her left, delivered a fiery speech from the convention floor. He criticized Swanson for a 2010 endorsement from the National Rifle Association and a decision to quietly drop out of a lawsuit suing the Trump administration for the travel ban. On the first ballot, Pelikan was a close second to Swanson. Before a second ballot could be announced, Swanson dropped out of the endorsement contest and left the building, only to emerge two days later as a last-minute candidate for governor, setting off a flurry of people scrambling to file for her office. For plenty of political watchers, the situation felt like 2006, when Swanson was part of a last-minute group to jump into the attorney general race. But the race has already put more attention on Swanson than she has ever experienced in the attorney general's office. With concerns from Democrats about her past support from the NRA, she's had to clarify her position on guns, now supporting some form of "enhanced" background checks and banning bump stocks. And she's facing intense pressure from within her party to drop her running mate, Nolan, after allegations emerged in MinnPost that a congressional staffer harassed employees under his watch. Instead of dropping Nolan, Swanson defended him. "Congressman Nolan has a long, effective, and distinguished track record representing Minnesota and has fought for gender equality throughout his entire career," she said in a statement more than a day after the allegations emerged. It's a position that's only increased scrutiny on her. "No secret, Swanson has been silent on her stance regarding most issues. MN can't let it slide. Enabling sexual harassment is unacceptable and it endangers women," tweeted Faith in Minnesota, a DFL-aligned faith political group supporting Murphy's campaign. Others have raised questions about Swanson's ability to build coalitions of support for her priorities in the governor's office, given the insular reputation of her office and the nature of the attorney general as a litigator-in-chief. "In order to evaluate her as a candidate for governor, I think one would have to look very careful at how she interacts with a very broad range of people with very different interests," said Beverly Heydinger, who worked in the attorney general's office under Skip Humphrey and interacted with Swanson as former chair of the Public Utilities Commission. "What are examples where she has demonstrated that capacity to convene, discuss and shape policy?" she asked. "I am not aware of examples." For her part, Swanson said if she wins the race, she plans to meet with all 201 legislators before the 2019 legislative session starts in January. She wants to "find out what makes them tick, why they ran, what's their issue," she said. Those efforts could help bridge a divide between Republicans in the Legislature and the governor's office, one that ended the 2018 session in acrimony and few accomplishments. "I'm troubled by the tumultuous political times in which we live," she said. "Both parties have responsibility for that." And Swanson contends that her time as attorney general wasn't just a string of court battles. One of her skills is negotiating, she said, landing hundreds of millions of dollars' worth of settlements for the state. She said that skill will be invaluable in the governor's office. "People think the attorney general is these lawsuits and going to court. One of my skills is negotiating," she said. "When you negotiate you've got to find common ground, and it means one side doesn't get everything."